Some of us get dipped in flat, some in satin, some in gloss; but every once in a while, you find someone who’s iridescent, and once you do, nothing will ever compare. Flipped is drama movie directed by Rob Reiner, starring Madeline Carroll as Juli Baker and Callan McAuliffe as Bryce Loski. This movie is an adaptation of Wendelin Van Draanen with the same title. Bryce meets Juli when his family move to another house, right across Juli’s home. When they first meet, Juli know it is love while Bryce is not so sure about it. Juli is a unique and always-want-to-know things, but Bryce feels annoyed with Juli’s behaviour. He tried to stay away from Juli, eventhough it is useless because they live in the same street and go to the same school. Day by day, year by year, Juli still admire Bryce. After realizing some events, finally Juli thinks that she might be wrong about Bryce. While Bryce begins to see Juli the way he never seen before. Crazy Little Called Love (2010) is a Thailand romantic comedy starring Fern Pimchanok Leuvisedpaibul (as Nam) and Mario Maurer (as Shone). Nam is a high school girl who is secretly in love with her senior, Shone. Shone is a charming 10th-grade-student who interested in photography and football. He often teased by his schoolmate because his father failed to take penalty shoot on the football cup. Eventhough, many girls are still crazy for him, including Nam. Aware as not-a-dazzling-girl in the school, Nam, with the help of her friends, try everything to improve herself to get Shone’s attention. She start to treat her dark skin and start to study diligently. On the next next next grade, Nam has become a beautiful girl. Then come another charming boy at school, Top, Shone’s best friend. Top has expressed his love, but Nam refused him because of her love to Shone. But, Shone and Top already have agreement that they won’t love same girl. This promise makes Nam’s love to Shone seems not possible. In the end of school year, Nam will go to continue study in America and Shone will take a football career. Before they separated for long time, Nam expressed her feeling to Shone with all of her courage. But sadly Shone has been dating someone. After that meeting, it turns out that Shone also has a feeling for Nam. This movie has a simple storyline. It describe first love and its cheesy things. That CHEESY!!! Although the story is simple, unfortunately the movie is told with a bit long-winded and makes the duration is quite long, almost two hours. But don’t worry because the transformation of Nam may not be boring and can be a refresher during this film. Pretty good movie, nothing special but still entertaining. Besides that, love can make someone change, either to fit with his/her loved one or to get his/her attention. It’s good if the change go to the positive direction. First Love 2: The Sequel, 9 Years Gone. This sequel takes part after the 9 Years of Shone and Nam’s life. The director confirmed that there is a sequel, however, it is still only in draft-processing but will be released soon. If ever there will be, Mario Maurer will reprise his role as Shone and Fern Pimchanok Leuwisedpaiboon will reprise her role as Nam. Late night, I tried to watch one of DVDs that I just bought. Black Swan. 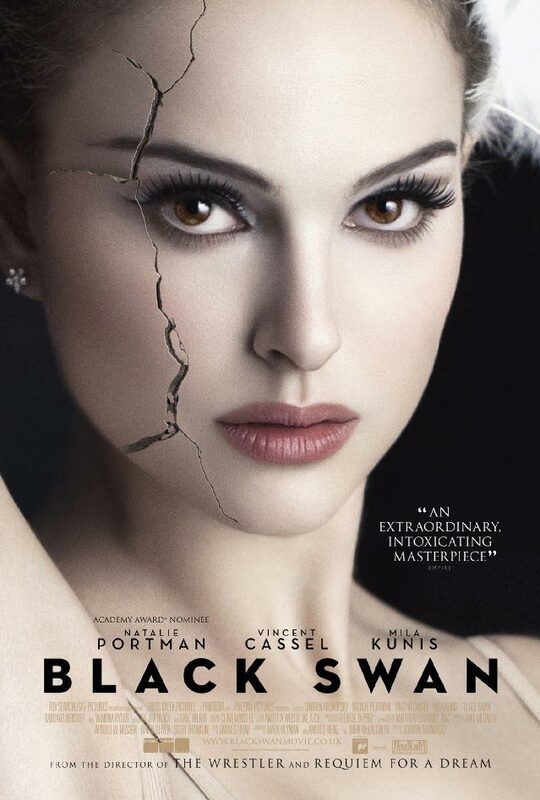 Black Swan is a psycho-thriller movie about Nina (Natalie Portman) on her way to be a perfect dancer performing Swan Queen. When the ballet company is preparing the production of Swan Lake, an artistic director Thomas Leroy (Vincent Cassel) has to cast new lead dancer who can play the role of innocent, grace White Swan and dark, sensual Black Swan. Nina fits the White Swan role perfectly, but she is too rigid to play the Black Swan role. On that situation, Thomas impressed with Lily (Mila Kunis), a new dancer at the company. He then make Lily as Nina’s alternate. The director of Black Swan, Darren Aronofsky, brings the darkness side of dancer’s life in this movie. Pain, jealousy, and perfection. This story at glance may look like story of two people struggling to get lead role as Swan Queen. But, with the creativity of the director, that simple theme delivered with high complexity, thrill, and horror. Black Swan is a story about fighting yourself to be the perfect one. It’s about perfection meets destructive obsession. It’s about Nina finds her true self as she tries perfectly to role Black Swan. Maybe the story like this has often happened in the world of art, act, and dance. Sometimes, actors need to contemplate to live up the character they played. They eliminate their identity and put character they played. Totality is important but the process will be very difficult as experienced by Nina. When the pressure to perform prestigious role is really high, she displays many psychotic symptoms, delusion, and hallucination. I salute the ability of Aronofsky to bring a movie like this. I salute to Natalie Portman, too, who played her character very well. It’s very different to see her in this movie compared with No String Attached. Because I have a right to be heard. I have a voice! Di tengah keringnya film bagus di dunia per-bioskop-an, akhirnya ada film yang super layak tonton banget. Ya. 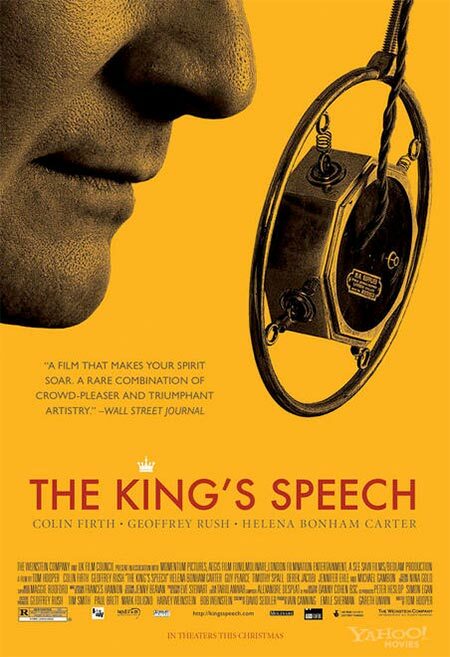 Film “King’s Speech” ini! Film ini berlatarkan Inggris tahun 1930-an, menceritakan Prince Albert (diperankan Colin Firth), Duke of York, yang menderita stammer (gagap). Hal tersebut menjadi sangat sangat masalah ketika ayahnya, King George V (Michael Gambon), meninggal dan kakaknya, Prince Edward (Guy Pearce), yang seharusnya melanjutkan tahta ayahnya malah terlibat kontroversi dan memutuskan untuk tidak menjadi raja, sehingga otomatis Prince Albert lah yang memegang tahta kerajaan dan kemudian dikenal sebagai King George VI. Ketika Prince Albert (Bertie) menyampaikan pidato pertamanya di depan umum, kegagapan menjadi hal yang sangat memalukan baginya. Berbagai macam metode pengobatan telah dicoba, namun nampak tidak ada hasilnya. Istrinya, Elizabeth Bowes-Lyon (Helena Bonham-Carter) akhirnya menemui seorang terapis, Lionel Logue (Geoffrey Rush), dan meminta tolong kepadanya untuk mengatasi kegagapan Bertie. Proses terapi ini memang berjalan kurang mulus pada awalnya karena metode-metode yang dilakukan Lionel sangat tidak lazim. Bertie yang high-temper pun tampak agak sulit diubah pemikirannya. Setelah menjadi raja, akhirnya Bertie harus menyampaikan pidato pertamanya mengenai kesatuan rakyat Inggris dan deklarasi perang dengan Jerman. Sejujurnya, film ini merupakan film yang mudah ditebak. Namun, alur cerita yang mengalir dengan enak sungguh tidak membuat bosan. Persahabatan antara Bertie dan Lionel terbangun begitu natural, ga tiba-tiba, ga dadakan. Pemeran-pemeran dalam film ini emang menunjukkan kelasnya lah. Ga salah banget pilih Colin Firth, Geoffrey Rush, dan Helena Bonham-Carter sebagai pemeran utama. Selain didukung artis-artis ternama, setting film ini juga ga setengah-setengah. Cerita, latar, pemain bener-bener digarap dengan baik. A Boeing 747-400 passenger jet can hold 416 passengers. This blog was viewed about 3,000 times in 2010. That’s about 7 full 747s. In 2010, there were 107 new posts, growing the total archive of this blog to 131 posts. There were 140 pictures uploaded, taking up a total of 29mb. That’s about 3 pictures per week. The busiest day of the year was October 26th with 48 views. The most popular post that day was pagi yang tidak biasa. The top referring sites in 2010 were twitter.com, en.wordpress.com, aprabaswara.wordpress.com, facebook.com, and amelabong.blogspot.com. Some visitors came searching, mostly for koala, tata surya, letters to juliet, juice avocado, and avocado juice. What’s so special about this night? Orang-orang buru-buru menyusun resolusi setahun ke depan. Hmm bagus sih… Mungkin karena pas ganti kalender aja kali yaa. Ada momentumnya gtu. So, ngapain aja malam tahun baruan kalian?